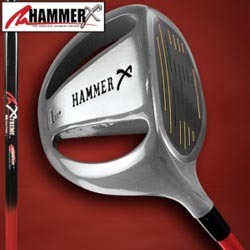 The Hammer x Driver is a golfing driver designed by legendary golfer Jack Hamm. It has a unique designed where it has the world's first zero-cc see thru design compare to traditional drivers like the Callaway Diablo Octane Driver. It claims it will increase your clubhead by 20%. It has 600mm sweetspot. And claims to automatically add upto 50 yards to your shot. The Hammer x Driver claims to also eliminate any slice. With your help we can reach more people and let them know about Hammer X Driver whether this product works or not. I'm in my third year of golf and struggling quite a bit with my swing, due to several sports injuries that limit my swing. I watched the infomercial for the Hammer X a couple weeks ago. I thought, "what do I have to lose, they offer a 60 day money back guarantee". So I ordered it. The salesman on the phone asked if I wanted it in the steel color or if I wanted black, blue or red. That painted head was an extra $20. They advertise it WITH the X-shaft but it's an extra $39.95. I did watch the infomercial again and they do have it in writing at the bottom of one picture that the X shaft is Xtra!! But what is NOT mentioned is, that if you order a "customized" club, you can't return it. That's B.S.! You aren't told that until the club arrives and it's in the paperwork. I want to find out how I can make this phoney piece of crap give me my money back. I hit it consistently shorter than my Callaway Razr X Black. Don't waste your money on this club!